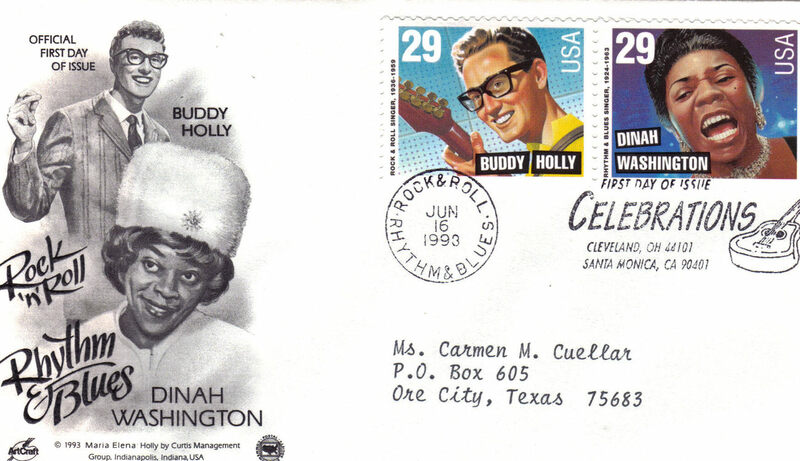 This is the Ofificial 1st Day Of Issue of CELEBRATIONS Cleveland, OH and Santa Monica, CA stamped June 16th 1993 for Rock 'n' Roll BUDDY HOLLY Rhythm Blues DINAH WASHINGTON. Charles Hardin Holley, known professionally as BUDDY HOLLY, was an American singer-songwriter and pioneer of rock and roll. Although his success lasted only a year and a half before his death in an airplance crasth, Holly is described as "the single most influential creative force in early rock and roll" whose work and innovations inspired influenced contemporary and later musicians, notably The Beatles, The Rolling Stones, Don McLean and Bob Dylan. Holly was amongst the 1st group of inductees to the Rock and Roll Hall of Fame in 1986. DINAH WASHINGTON was a blues, R B jazz signer well known for singing Torch Songs. A 40-song box set "Smoke Gets In Your Eyes' was released in 1999. Measures 6-1/2" L x 3-5/8" H Excellent condition Send email if you need additional details. Buyer is responsible for 1.95 shipping to anywhere in the USA Canada. Do check the store for many more Las Vegas Collectibles daily. Thanks for stopping by!